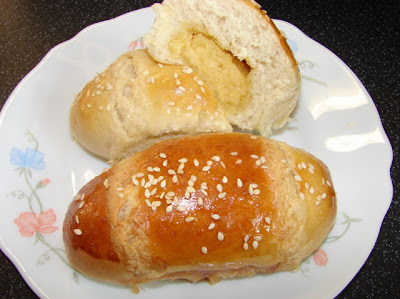 Cocktail buns (雞尾包 gai mei bao) were originated from Hong Kong, now available in nearly all oriental bakeries in the world. These are soft buns filled with a buttery coconut filling. I love them since I was a kid. Not very slimming but utterly delicious especially when they are still warm. Most bakeries use dough improver to make the buns very soft. I love the softness of the bun texture but reluctant to use any additives or chemicals. I have read about adding cooked flour paste can make the bun (bread) really soft, so am going to try for this recipe. The result was a success. The buns were tasty and soft. I will from now use this method for soft buns. I just had a few of these buns while typing this post. Very full but feeling really satisfied!! May need some indigestion tablets ;).. Mix water and flour for the flour paste till no lumps, then cook with gentle heat till the mixture thicken. Leave to cool slightly, add butter and sugar stir till melted. The stir in beaten eggs. Dip your finger into the mixture, test if it is just luke warm if not leave it cool further. Mix both plain flour, bread flour and yeast together then mix in the liquid mixture. Then knead the dough for few minutes till smooth. Add more flour for dusting if the dough is wet. Cover and leave the dough to rise to double in size. While the dough is rising, make the filling. First using a small sauce pan heat the plain flour and custard powder for 2 - 3 minutes till hot. Leave flour to cool in the pan for about 1 minute. Add in the butter and sugar, stir till butter melted. Then add in remaining ingredients till all combined. If the mixture looks oily leave to cool in the fridge for about 15 - 20 minutes. When the dough has risen, knock it down, roll into a log shape and cut into 12 equal parts. Take each piece of dough roll into a ball then flatten it into an oval shape about 10 x 6 cm and put on about 2 tbsp filling. Seal the edge. If the dough won't seal properly dampen with a touch of water along the edge. shape into an olive shape. Use flour for dusting if necessary. Put the buns onto a greased baking tray (Swiss roll tin), sealed side facing down if not the bun can split open easily. When all the buns are made, leave the buns to rise for about 15 minutes. Make the topping mix, mix all the ingredients together till a soft paste is formed. Spoon this into a small plastic bag, cut the tip end for piping. Brush the buns with beaten egg then pipe on the topping mix and sprinkle the top with sesame seeds. Bake in a preheated 180 deg C oven for 15 minutes. While the buns are baking make the syrup by heating sugar and water together till sugar dissolves. I do this by putting both in a small bowl and ping in the microwave for about 30 seconds. When the buns are done, take them out and brush with sugar syrup. Sugar syrup makes the buns really shiny. Leave to cool and enjoy with a nice cup of tea. They look the business, Sunflower. They remind me a little of the buns you could get in Spain, with rich yellow thick custard inside. Hi Gill, they are kind of like custard but much richer. We also have custard buns in the far east. Maybe I could make some next time. You bread making skill is becoming very very good, well done you too. That's brilliant - I had no idea about dough improver so I couldn't understand why my buns (made them a few years ago) weren't as soft. Thanks for the cooked flour paste tip! This cooked paste is what others called Japanese water roux. I changed the method slightly but still worked. Thank you about the bread making. Thank you for this recipe. I'm going to be trying it soon! Gai mei baus are my favorite childhood treat. Thank you! I'll blog about it when I make them. This recipe worked out well. Thanks for sharing it. I tried this recipe today, but two things didn't work. 1) The dough didn't double in size and it didn't rise after the buns were formed with the filling inside. 2) I noticed the filling had a lot of excess oil after everything was mixed together. I'm still waiting for the dough to rise as I type this but I've followed the recipe exactly. Sorry the recipe did not work for you. - Is the yeast still active? - Did you use instant yeast or traditional dried granular yeast? - Before you add flour and yeast to the wet mixture, is the wet mixture too hot? Tf too hot this will kill the yeast. I will change the text to make sure people check this step. - How long did you leave it to rise? This will take from 1 hour to 3 hours at normal room temperature. Regarding to oily filling mixture, this can happen if the mixture is still too hot or if the room temperature is very warm. You can put the mixture to cool in the fridge the butter will set and the mixture will look less greasy. - The yeast is active; I tested it before doing the recipe. - I used instant yeast per the recipe. - I left it to rise for over 2 hours the first session. After the buns were formed, I left them for 45 mins and they still didn't rise so I baked them anyway. Thanks for the suggestion on the filling mixture. I can't tell you why your bread dough did not rise if you use instant yeast. Maybe try a different packet of yeast next time. The dough will rise double before forming into buns. After forming into buns they will expand but not that much. They will rise some more during baking. I had the same issue. When the dough was mixing I could tell it was way too dry and crumbly. Are you sure some liquid wasn't missed in the recipe? I did another recipe which used the roux of flour & water and that dough was very moist and had no issue rising. Thank you for pointing this out to me. I did a batch this morning exactly to above recipe dough was a bit stiff but not crumbly. I digged out my old notes and found I used 2 eggs instead of 1. Sorry for the misleading recipe. I have corrected it. Sorry for anyone else who has failed making this recipe. I will try with 2 eggs and see what happen.